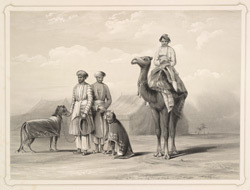 This lithograph is taken from plate 15 of Emily Eden's 'Portraits of the Princes and People of India.' Eden wrote: "These are Hunting Leopards of the King of Oude's [Nawab of Avadh] Establishment, which were sent to accompany the Governor General on his march." The animals shown are actually cheetahs. The art of trapping, training and hunting with cheetahs was highly developed: for thousands of years the animals had been prized tools of the hunt. The Mughals depicted the hunting cheetah in their paintings. With the spread of British rule and the popularity of hunting expeditions in which the rifle became the primary tool, the cheetah became a prized target. About fifty years ago the last of India's fabled cheetahs was extinguished by a maharajah's rifle.